The Zodiac Killer — the way the killer signed himself in letters to San Francisco newspapers from 7 August 1969 —struck for the first time at 11pm on 20 December 1968. David Arthur Faraday, 17, and Betty Lou Jensen, 16, were shot on Lake Herman Road in Vallejo, California as they sat in his mother’s Rambler station wagon. On 4 July 1969 Michael Renault Mageau, 19, and Darlene Elizabeth Ferrin, 22, were shot in the car park of the Blue Rock Springs Golf Course on the outskirts of Vallejo. Darlene died but Michael survived, despite being shot in the face, neck and chest. At 12.40am a man rang the Vallejo Police Department and boasted of the attack and also claimed credit for the Faraday-Jensen murders. On 1 August three letters arrived at the offices of the Vallejo Times-Herald, the San Francisco Chronicle and the San Francisco Examiner, all nearly identical and all claiming credit for both sets of murders. On 27 September, as they picnicked at Lake Berryessa in Napa County, Bryan Calvin Hartnell, 20, and Cecelia Ann Shepard, 22, were both stabbed. Bryan lived but Cecelia died two days after the attack. He told the police that their attacker had been wearing a hood with a zodiac symbol on it. The killer had also written on Hartnell’s car door “Vallejo/12-20-68/7-4-69/Sept 27-69-6:30/by knife”. At 9.55pm on 11 October taxi driver Paul Lee Stine, 29, was shot and killed on Cherry Street at Presidio Heights in San Francisco. This was the closest Zodiac came to being caught, as three teenagers witnessed the murder and called the police. The police were told the suspect was black so when Officers Don Fouke and Eric Zelms saw a white man near the scene they let him go. Zodiac claimed to have killed 37 people but police believe that there were only seven victims. During 1970 Zodiac wrote to newspapers many times including cryptic clues, astrological signs and ciphers. 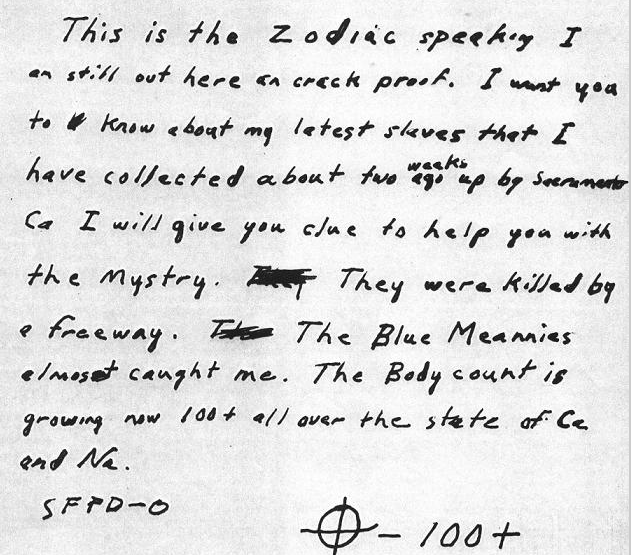 No more was heard until 1974 when the San Francisco Chronicle received further letters from the Zodiac Killer. The San Francisco Police Department investigated an estimated 2,500 suspects over a period of years. Only one, Arthur Leigh Allen, was ever seriously considered. However, after his death on 26 August 1992, his DNA was compared to that taken from the letters written by Zodiac. There was no match. The case remains open.